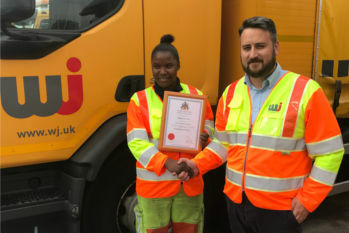 WJ Group's Jordelle Henriques is the first woman to complete the Road Safety Markings Association (RSMA) apprenticeship. The apprenticeship has been running for nearly two decades and is a requirement for all new entrants under National Highways Sector Scheme 7. WJ said the training remains 'vital' to the sector and was a forerunner in Highways and Construction Specialist Apprenticeship Schemes' but added that 'sadly, the road marking apprenticeship is now classed as a Special Applied-Skills Programme (SAP) scheme under the misguided and incoherent introduction of the government "Trailblazer" apprenticeships'. Companies cannot claim money back on training investments through an SAP, under the Government’s Apprenticeship Levy system. Road marking is one of the few highway maintenance sectors where operatives are trained to NVQ 2 level. Ms Henriques started with WJ Group a little over three years ago and took a highways construction course at her local college, where she took a 'surprisingly firm interest in road marking,' she said. Andrew Fawcett, WJ South operations manager, commented: 'Jordelle has been great for us, she’s hard working, and I feel privileged to be her manager. It is ridiculous that there is this perception of highways being a solely male preserve, we are actively breaking down this misconception by promoting fairness, inclusion and respect in construction. WJ's outreach recruitment drive, which aims to tackle the well-known lack of diversity and skills gap in the highways sector, has worked with young offenders and organisations such as Construction Youth Trust. It has also set up a relationship with Keele University running internships that have led to a new stream of graduates who are bringing their own skills to drive the continual improvement aspirations of the WJ Group.